Combine flour and cocoa; set aside. With electric mixer, beat butter, sugar and baking powder until blended. Add egg, vanilla and cherry flavoring; beat until well combined. Shape dough into 1-inch balls; place 1/2 -inch apart on ungreased baking sheet. Press down center of each ball with thumb to create a small hollow; fill each center with a cherry. In small pan over low heat, combine chocolate chips and condensed milk; heat until chocolate is melted. Spoon about 1 teaspoon chocolate mixture over each cherry, spreading to cover cherry. Bake 10 to 12 minutes or until done. Remove to wire racks and cool. Mix baking mix, sugar and lemon peel. Combine sour cream, melted butter and egg; mix well. Add sour cream mixture to baking mix mixture and stir only until moistened. 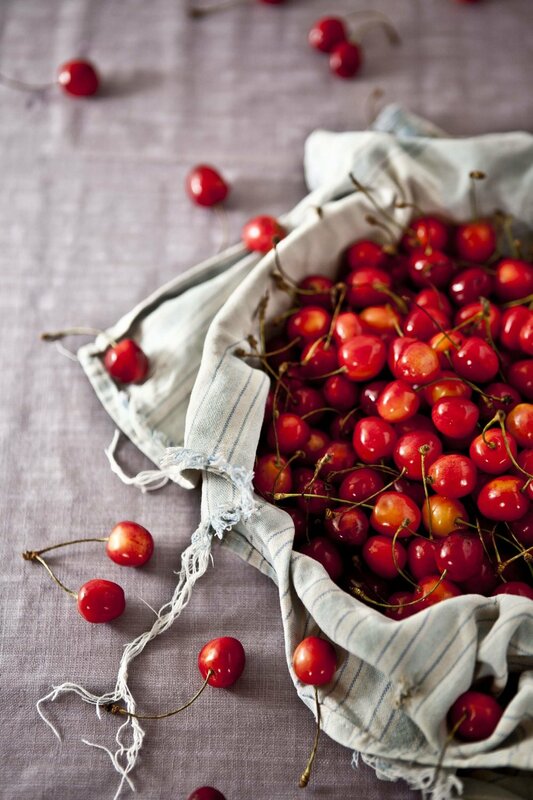 Fold in 1/2 cup cherries. Pour into oiled and floured 8-inch square baking pan. Sprinkle remaining cherries and Streusel Topping over batter. Bake for 35 to 40 minutes or until wooden pick inserted near center comes out clean. Combine 1/2 cup flour, 3 tablespoons packed brown sugar, 1/2 teaspoon ground cinnamon and 1/4 teaspoon salt. Mix in 3 tablespoons softened butter or margarine with a fork. Add 1/4 cup chopped walnuts and mix well. Per Serving: 341 Cal., 5.1 g pro., 16.6 g fat (44% Cal. from fat), 42.8 g carb., 52 mg chol., 1.6 g fiber. 488 mg sodium.